First let me apologize in advance for I know almost nothing about biology. I had a conversation today with a family member who is a bio-computer-scientist and he talked to me about what his colleagues (biologist) are doing and I feel a bit confused about what he explained (for my defense I feel he was a bit confused too). For background : they work in Chile and are studying plants that live in the desert (Atacama). If I understand correctly his team is trying to explore the idea (is it a new idea ?) that some viruses might actually be good for the plants they are infecting and might have been "selected" and are now "part" of the species. The way I understand it is that they collect samples of plants and somehow by analyzing their DNA notice that these plants are all infected by some kind of virus and they tell themselves that maybe if all the plants have the virus it's because it's good for the plants. 1) Does any of this make sense ? 2) If it does how would the selection process happen ? Combining my (old) high-school knowledge and wikipedia I see a virus as a piece of DNA that goes into a cell and then uses the cell's tools for it's own purpose, but it is not part of DNA. So how can it be treated as part of the plant ? 3) Do you know any good references (preferably for an enthusiast layman) about this subject (i.e. the potential good of some viruses and maybe potential applications in bio-engineering) ? I find especially fascinating the idea that maybe evolution isn't just the result of mutations but also of "contamination". Let me first react to your title: Viruses selected by evolution. Evolution is any process of genetic (and eventually phenotypic) change in a population through time. Selection (Natural Selection for example) is one of such process. Genetic drift is another such process. So, evolution doesn't select viruses unlike your title suggests. Viruses are selected and therefore evolution occurs. When saying "viruses are selected", it means some viruses have a higher fitness (fitness is a function of both survival and reproductive success) than others. Species interact. Species actually interact a lot. One can classify species interactions into categories. 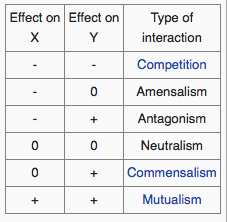 Here is a table of possible biological interactions (comes from wiki), where a + indicates "beneficial", a - indicates "detrimental" and a 0 indicates it has no effect on fitness. It may seem pretty obvious that two species should have either one type or another type of interaction. However, the reality is often more complicated than that. An interaction might fall under one set of environmental conditions and fall under another category under another set of environmental conditions. In addition to that, it is not uncommon that due to selection on the host genes due to the presence of a parasite, the host evolve so to tolerate the presence of the parasite up to the point of actually having a lower fitness in the absence of the parasite. Parasites often have different life cycle of alternance of generation. That is a parasite sometimes need several hosts such as the parasite causing malaria for example that need both mosquitoes and a primate. Consider for example a snail which is infected by a parasite. Let's assume (I think it is a real world example but I am too lazy to find out a reference) that the parasite need the snail to be eaten in order to reproduce in the body of the predator. In order to improve the chance of its host to be eaten the parasite is selected so to diminish the thickness of the snail's shell. In response to that, there is selection (which intensity depend also on the proportion of infected snails in the population) for having thicker shells. But now, snails that are not infected have shells that are so thick that the can't move as fast as they'd need to forage. So, by the end infected snails may have a higher fitness than non-infected snails. And therefore the interaction between the snail and its parasite is not a parasitic interaction anymore but a mutualistic interaction. Can viruses have non-parasitic relationship with their host? Well... why not? There is nothing so fundamental about viruses that would prevent them to have mutualistic relationship with their host. Actually I am aware of a few relationships. For example, female parasitoid wasps (parasitoids: parasite that kill their host). parasitoid wasps lay their egg in other insects larvea (host), the egg (and later the larvea I think) develop in the larvea (host), eat the larvea (host) and once the host is dead, the individual metamorphose to its adult form and fly away to find a mate a parasite the next larvea. Some lineage of those wasps have viruses in their ovary that infect the host to reduce the immune defence of the host to protect the growth of their egg (Flemming and Summers 1991). This is an example of mutualistic relationship between the wasp and the virus. Most likely, they make a PCR (amplification of DNA, that is increasing the number of copies of a given DNA sequence) on viral DNA and look for a signal. In other words they are not sequencing (=reading) the plant DNA but only seeking for viral DNA. If they find viral DNA, then the plant is infected if not, the plant is not infected. From your post, it is unclear to me yet how your "family member" plans to decide the type of interaction there are between viruses and plants. Knowing the frequency of infected plants won't tell you much about the interaction between the plant and the virus. They will likely have to make growth experiment and try to measure the fitness of infected and non-infected plants. Knowing that every plant individual is infected doesn't tell much of the virulence of the virus. The frequency of infected is not an information that can help understand the "type of biological interaction" (paratism, mutualism, etc..). One will need to actually make growth experiment and measure fitness (or measure phenotypic traits that are known to be good proxy for fitness). One question about your answer is : can we really speak of a virus as a species and especially does your table really apply in this situation ? The concept of species is not a natural category. It is a man-made, unclear, sometimes useful, category. Typically, it is hard to even talk of species for organisms that don't have sexual reproduction (which is the case of viruses). I wrote this other answer today about the concept of species, you may want to read it. Here is another post on the subject. Btw, talking about semantic issue, viruses are often not considered as alive. All those semantic issues don't have any impact on our understanding of biological processes. But yes, the table applies to viruses as well. This table is indifferent to the concept of species. Consider just two genotypes (two individuals), one plant and one virus, the existence of the virus has (or has not) an impact on the fitness of the plant (and vice-verse) and therefore, you can classify the relationship between those two genotypes (individuals) into one category of the table. As a reminder, the nature of those relationship may depend on the environment. Typically, a photosynthetic endosymbiote might be very beneficial to the "host" if there is some sunlight but might be quite detrimental in the absence of sun light. Not the answer you're looking for? Browse other questions tagged botany plant-physiology ecology virology host-pathogen-interaction or ask your own question. Are there examples of now-living species where one is descended from the other?